Tony Gwynn was the best contact hitter of his generation, claiming a record eight National League batting titles. He spent his entire career with the San Diego Padres, earning the love and respect of fans as well as his fellow players. This top list offers some of the best Tony Gwynn baseball cards of all-time, including his famous rookie cards and later limited-run appearances. 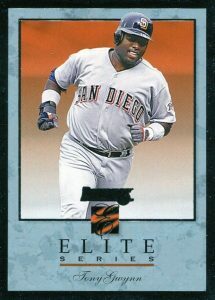 Shop for Professionally Graded Tony Gwynn cards on eBay. 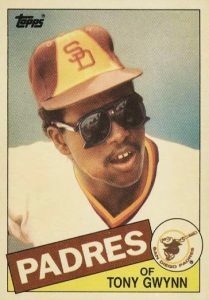 Gwynn seemed destined to play for the Padres from the very beginning, as he was born in southern California and attended San Diego State University. However, his main focus in college was basketball where he was an outstanding point guard. 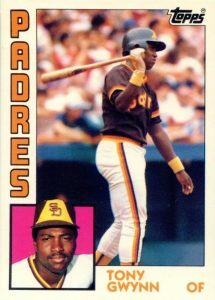 Like another Padre great, Dave Winfield, Gwynn was also drafted by multiple professional leagues. This includes the San Diego Clippers (before their move to Los Angeles) who picked Gwynn in the 1981 NBA draft. 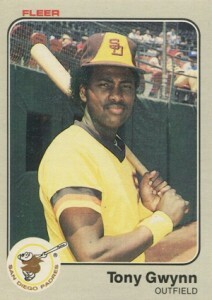 Ultimately, Gwynn chose baseball over basketball and made his major league debut in 1982. He would quickly establish himself as an aggressive hitter who had the ability to hit balls anywhere in the field. And, given his proficiency hitting outside of the strike zone, he would also prove to be nearly impossible to strikeout. In 1984, Gwynn won his first National League batting title, adding an amazing seven more throughout his career. He won four consecutive batting titles from 1994 to 1997, including an amazing .394 average during the strike-shortened season in 1994. It was the closest a batter has come to crossing the .400 mark since Ted Williams in 1941. During the 1999 season, Gwynn would cross the 3,000-hit mark, finishing his career with 3,141 hits, 15 appearances in the All-Star Game, and seven Silver Slugger awards. "Mr. Padre" would ultimately be elected to the Hall of Fame in 2007 on the first ballot with Cal Ripken, Jr.
For fans interested in Gwynn's brief basketball career, there are a few modern trading cards featuring him during his hoop days as San Diego State. Look to 2012-2013 Fleer Retro for several base cards and 2013-14 Upper Deck Black Basketball for an autographed Tony Gwynn basketball card. Some early Gwynn autographs that didn't make the list include his first certified autograph from the 1996 Leaf Signature Series. The set featured just 1,000 autographs, making his even harder to locate. Another beautiful Gwynn autograph can be found in 1999 Upper Deck Century Legends which includes arguably the strongest autograph lineup ever compiled. In addition to the basic autograph, there is a gold edition that is limited to 100 copies. Because Tony Gwynn's career stretched over 20 seasons, he has thousands of trading cards available. The ten cards selected for this list include some of his earliest, most valuable cards along with rare cards from the era of over-production. Value, design, and overall importance to the hobby were major components in each card's selection. Outside of Gwynn's rookie cards from the three major card makers, his remaining cards from the 1980s can be found at relatively low prices. An obvious exception to this are the Tiffany sets created by Topps that began in 1984 and continued through 1991. The cards are nearly identical in design to the regular Topps base set with a change to the card stock and a glossy finish. It is said that 5,000 sets were produced of the 1985 set, making it an exceptionally rare card for the time period. 1997 Donruss Preferred featured 200 cards, split between several different metals, including Bronze (100 cards), Silver (70 cards), Gold (20 cards), and Platinum (10 cards). Players were assigned individual levels based on personal performance, with superstars given the rarest card designation, Platinum. As you might expect, Gwynn was featured as one of the Platinum players and his base card has become one of the most valuable. Along with the famous Donruss inserts like Diamond Kings, 1996 Donruss also featured the very rare Elite insert. The 12-card set features Gwynn last on the checklist. I personally enjoy the silver design quite a bit as it gives the card a high-quality feel. Adding to the interest, each card is serial numbered out of 10,000 on the reverse. 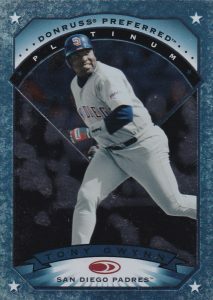 Tony Gwynn has several cards in 1996 Topps Finest, and the Refractor version of each appearance is one of the most in-demand cards from the final stages of his career. The Finest Franchises insert details Gwynn's role as the statistical leader in nearly every Padres offensive category, including batting average, RBIs, hits, doubles, and, surprisingly, stolen bases. 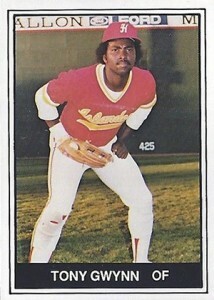 Gwynn's second-year card can be found in 1984 Topps as well as 1984 Topps Tiffany. The Tiffany set debuted in 1984 with bright white cardboard and a glossy finish that was rare in the trading card world at the time. Although given the name "Tiffany," the production has nothing to do with the famous high-end jewelry store. Instead, it was a nickname that described the limited nature and improved quality of the cards, as the original Tiffany set had a production run of only 10,000 sets. 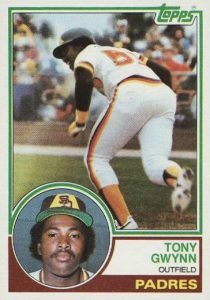 Highly-graded versions of Tony Gwynn's TCMA minor league card featuring his brief stint with the Hawaii Islanders before joining the Padres can sometimes eclipse the price of his true rookie cards in 1983 Fleer, Donruss, and Topps. The Islanders were a Pacific Coast AAA team which would also feature Barry Bonds on their roster a few seasons later. The first of three official Tony Gwynn rookie cards on the list can be found in 1983 Fleer. 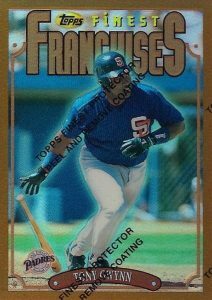 The set's brown border design compliments the Padres colors nicely as Tony is photographed standing in the on-deck circle with the bat on his shoulder. Gwynn would choose the lightest bat available which helped him have a quick swing and make contact with pitches outside the strike zone that other batters might miss. Gwynn's second most popular rookie card can be found in 1983 Donruss where it is the set's most valuable card, often edging out debut appearances by Wade Boggs and Ryne Sandberg. During Gwynn's brief 1982 season, he hit .289 and followed that with a .309 average in 1983. Gwynn's batting average would not fall below .309 for the remaining 18 seasons of his career, finishing with a remarkable .338 career batting average. While Gwynn's rookie cards dominate the top spots on this list, one of his earliest mainstream autographs from 1998 Donruss Signature Series slips in here at the #2 spot. 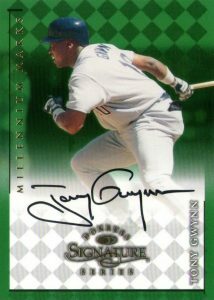 This Tony Gwynn autograph can be found in the Millennium Marks insert set which is more limited than the standard red base autographs. As the name implies, there are typically 1,000 autographs available but, it appears Gwynn only autographed 900 in his contribution to the set. 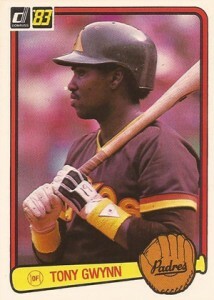 The Tony Gwynn flagship rookie appearance in 1983 Topps is certainly his most popular card. He again leads the way by having the most valuable overall card in the set, with highly-graded versions topping $600 at auction on a regular basis. Completist collectors can also find the Canadian O-Pee-Chee version of his rookie card and, while the design was very similar between the O-Pee-Chee and Topps sets, the O-Pee-Chee set features just 396 cards making Gwynn's rookie #143 in that set while he is #482 in the Topps set. The reverse side of the O-Pee-Chee card also famously has both French and English statistics. The OPC were also famous for being almost impossible to find in great condition. TONY GWYNN 1998 UPPER DECK SP CHIROGRAPHY AUTOGRAPH AUTO -PADRES! !